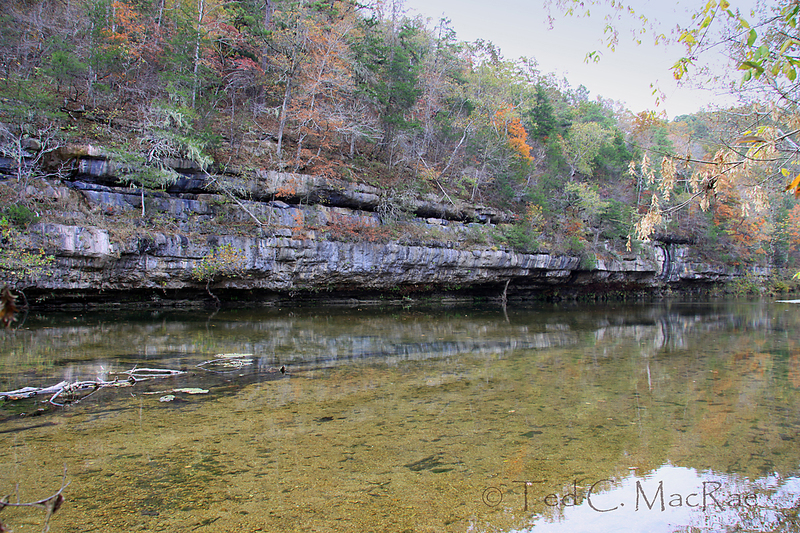 The North Fork River in south-central Missouri, like most Ozark rivers and streams, flows clear and cold over gravelled bottoms. Sustained year-round by the numerous seeps and springs that result from the region’s unique Karst geology, it meanders through a mix of forest and woodland alongside massive bluffs of half-a-billion-year-old dolomite. While small rapids can be found where gravel bars approach the bluffs, for the most part the shallow waters course lazily and idyllically south toward the White River in northern Arkansas. 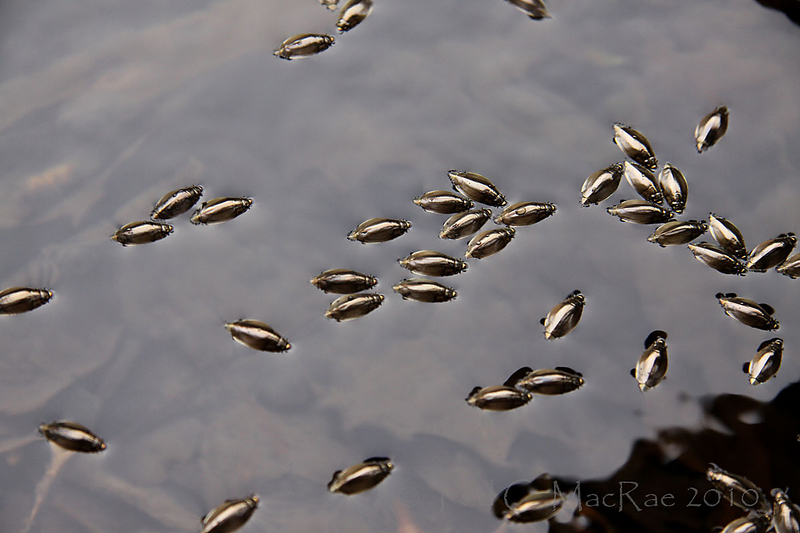 Lazy waters are the domain of whirligig beetles (family Gyrinidae). We encountered this ‘raft’ of beetles in a sheltered pool near the shore of the North Fork River while hiking the Ozark Trail last October. These frenzied little beetles live almost exclusively on the surface of the water, where they feed on organisms or scavenge debris in their famously and erratically conspicuous aggregations. Such behavior might make them seem vulnerable to predation, but in actuality the reverse is true. Beetles in rafts benefit from the increased number of eyes that can better scan the environment for potential threats than can individual beetles (Vulinec and Miller 1989), and the larger the raft the more efficiently this occurs. There is also evidence that the appearance of the rafts themselves is a signal to warn potential predators (primarily fish) of the noxious chemicals produced in the beetles’ paired pygidial glands (Ivarsson et al. 1996), despite the decidedly non-aposematic coloration of the beetles themselves. Photo Details: Canon 50D w/ 17-85mm zoom lens, natural light. Photo 1 – 17mm, ISO 100, 1/25 sec, f/5.6; photo 2 – 85mm, ISO 500, 1/160 sec, f/5.6. Typical post-processing (levels, minor cropping, unsharp mask). This entry was posted in Coleoptera, Gyrinidae and tagged beetles, entomology, insects, landscapes, Missouri, nature, Ozarks, predator avoidance, science, whirligig beetles. Bookmark the permalink. Whirligigs are fascinating to watch; I wonder if they were the inspiration behind Pac Man? Your photo really captures some of the spirit of the North Fork. I never thought about the Pac Man similarity! Hey! Another gyrinid post — cool! I don’t see any vittae and these guys seem fairly elongate. I suspect they are Dineutus discolor Aube. If so, they have a pale orange venter as opposed to the darker red for D. ciliatus (Forsberg). Both species are very common in the Ozarks and I’ve caught both aggregating, especially during the Fall months. The largest “raft” I saw during my thesis days was made by Dineutus assimilis (Kirby) on Lake Poinsett in eastern Arkansas. It approached 40 m in length and varied from 2-3 m in width. From a distance, it looked like a boat wake or just a bunch of flotsam…but each piece of flotsam was moving independently! On the Sulphur River near Texarkana I encountered multiple tight rafts of Gyrinus analis Say that were only a little over a meter in width, but the beetles were so close together, you couldn’t see water between them. When I first spotted them from the bank, I thought they were oil slicks. Of course, none of my pictures developed for that day. I was able to sample one of these rafts. I took one pass through with the net and then held a 4-oz collecting jar so that the beetles would tumble in. I filled the jar with maybe a third of the beetles from my net and later counted out over 3,000 specimens. I made a rough estimate at the time for the number of beetles in the aggregate and wound up with over 100,000. I suspect that I wildly underestimated the actual number. As I recall, I saw at least 4 such aggregates that day. Hi Brady – thanks for the ID help! Another neat aspect of the aggregations is that you don’t need to see the beetles to find them. I was able to find Gyrinus woodruffi Fall, a species that likes to hide in thick emergent vegetation, simply by smelling them! The pygidial fluid can be quite pungent for Gyrinus — I don’t recommend using an aspirator to get them out of your net, by the way. Blech! Worse than corixids. Interestingly, Dineutus smell quite sweet, hence their other nickname “apple bugs”. I’ve always thought that the odor was identical to that of Jolly Rancher sour apple candies…not that I would ever tell kids that sour apple candy is really made from whirligig beetles, mind you. Interesting. Are these pygidial secretions used for communication as well as defense? It seems there wouldn’t be much species-specificity if they functioned only for the latter. I have no idea. I read all the papers up to when I was working on the thesis, but haven’t followed anything since then. I would suspect that if communication was involved it would be more of an “intruder alert” sort of situation. If one beetle gets upset and releases some pygidial fluid, it may upset the few nearest. If a bunch of beetles get upset, everyone in the area detects the alarm. It is fun to watch aggregations reform after being disturbed, say, by a guy with a dipnet. The Gyrinus aggregates in particular will scatter everywhere at once. After a time, they will start making their way back in single file synchronized (wavy) lines of dozens to hundreds of individuals. Maybe there is some wiggle room in what compositions are actually effective as deterrents, so that different species have come up with different compositions that are all nevertheless effective anti-feedants. I haven’t noticed Gyrinus spp. here in Missouri as often as I’ve noticed Dineutus – perhaps because they’re smaller and I haven’t made the effort. Those single file lines during re-aggregation sound fascinating! Brady, I had no idea that these beetles formed rafts, much less of such enormous size. Fascinating! My original thesis topic was to look strictly at gyrinid aggregation behavior. I was having so much fun collecting and identifying that I abandoned that topic for a survey instead. I still looked closely at aggregates when I encountered them and found, in Arkansas anyway, most aggregrates were composed of single species. Occasionally, you’d find a few species together. Once, I found Dineutus, Gyrinus and Gyretes together. However, I saw nothing like what Hilsenhoff reported from Wisconsin. He hit aggregates with up to 13 species there, but then, there is much higher diversity in the Gyrinus in the northern states. I still had a lot of fun with my topic…not that I’ve published it yet. Just a tip, Brady – Get on it soon, or it will have increasing likelihood of slipping through the cracks. I speak form experience! Ted – I just recently read Bernd Heinrich’s account of the nightly dispersal to feed and matinal reaggregation of whirligigs, in his first book. So this post seems very timely! I like the sound of the term “aposematic whirling”. This year in Arizona, researchers who work on the eyes and ‘visual ganglia’ of these beetles had a hard time finding enough (D. sublineatus). Traditional collecting ponds/creeks had dried out. We should have you send some, or we should hope for more rain this year. Promising so far. Striking photograph of what must be a beautiful river. I guess I’ve noticed that gyrinids on the lakes here tend to occur in patchs, but never really thought of them as aggregations. Thanks for expanding my mind and to Brady Richards for his comment. Thank you, Dave! And I’m glad to have such erudite readers to help keep me on my ID toes! Hi Ted! Nice pics – that photo of the beetles must have been tough (but fun) to take! Yeah, whirligigs are tough to photograph. I didn’t worry about getting real good closeup shots in this case (already tried that once) – I just used a wide angle at max zoom (85mm) and natural light to get a shot of the raft (a rather small one in this case). Beautiful shot of the beetles, Ted. I find anything aquatic very difficult to photograph. Fascinating thread of comments here too! I’d love to see a “raft” of these insects one day! Thanks, TGIQ. I imagine if I ever get the nerve to try something underwater I’ll really find out how difficult aquatic insect photography is. No matter, there are more than enough terrestrial bichos to keep me busy for the foreseeable future.